Would you like to improve the quality of your legal documents, while maintaining efficiency? It enables your staff and lawyers to create better legal documents faster. Creating legal documents is time- consuming and complex. Maintaining consistency is difficult when no one is sure what the firm standards are. 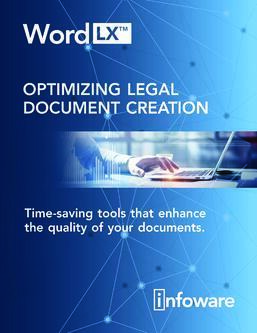 Word LX™ (a Microsoft Word add-in) helps law firms overcome these challenges by improving document accuracy, consistency and productivity. Allows staff and lawyers to save up to at least one hour per day. Standardizes the document creation process in order to reinforce brand standards across your firm. Simplifies formatting and editing tasks with legal-specific automation tools, such as numbering schemes and tables of contents. Makes legal document creation in Microsoft® Word faster and easier.